Landman Wood Burning Fire Pits are perfect for spring, fall and summer in New England. With specialty designs and traditional designs available, these wood burning fire pits make enjoying the backyard easy and fun. The summer is about enjoying the outdoors. With Landman Outdoor Wood Burning Fire Pits you can enjoy three seasons of the year in the backyard with family and friends. Made with durable materials, these fire pits are far superior to those found in the big box stores. The large diameter of the fire bowl will draw friends and family to enjoy a fire and conversation. 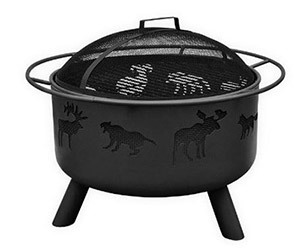 These fire pits offer all types of unique designs for interesting viewing and easy access to the fire. West Sport in Sudbury offers everything hearth, grill and outdoor living related for your home including Malibu Hyannis Adirondak Chairs, propane refills, Saber Cast 500 gas grills, and Fire Magic built-in gas grills. West Sport outdoor fire pits have been installed in Framingham, Natick, Lexington, Newton, Wellesley, and other towns in Massachusetts.